A centuries-old practice used as a way of naturally cleansing the inside of the ears, removing pressure and inner blockages through a holistic non-invasive process. While lying on your side, a cone of beeswax and muslin is lit and held by your ear. 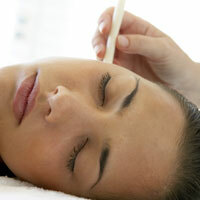 The warm atmosphere created in the cone, draws the wax and debris up out of your ear canal. This experience, may help alleviate the painful effects of chronic sinus conditions, ear infections, allergies, as well as minor hearing loss due to excessive earwax build up. Natural Minerals and a personalized Plant Pure-Fume Steam Tent will be used to exfoliate and refine your skin. This unique AVEDA experience is an exfoliating body treatment including some scalp and foot reflexology techniques. The healing effects will leave you with reinvigorated, healthy-looking skin. This experience is the same as the Aveda Aroma Body Polish without the Steam Tent. A facial for your back! Designed to bring purity and balance to that hard-to-reach back, neck and shoulder area. This treatment will focus on cleansing, skin exfoliation, gentle back massage and herbal treatment masque therapy. Perfect if you are having skin challenges on the back, for seasonal skin changes or for a special occasion. This aromatic heat treatment and exfoliation will rid the body of everyday toxins like smoke, pollution and other harmful effects. The Aveda Aroma Body Wrap: Dry Room is a seaweed body wrap treatment customized with Aveda body care products and aromas. To begin, a dry exfoliation, AVEDA seaweed masque, is applied to your back. After exfoliation, you are wrapped in the warmth of massage oil and linens, resulting in truly and revitalized skin. This invigorating experience includes scalp and face massage and foot reflexology techniques. This purifying treatment is based in the science of Ayurveda Panchakarma, the ancient healing art of India. It is used as a detoxification that people receive once or twice a year between the changing of the major seasons when the body’s immune system is working overtime. Generally this occurs, Summer into Fall and Winter into Spring. With this experience, you can nurture your entire being by connecting body and mind for a truly exceptional one of a kind experience. The treatment begins with a lymphatic and pressure point facial and scalp massage combined with an inhalation therapy using essential oils to help open breathing. Subsequently, a deep and dry exfoliation performed with exfoliation gloves, will help prepare the skin for receiving the benefits of the massage oil. This is followed by an energetic and vigorous Ayurveda style massage that is designed to warm the tissues and loosen up toxic residue so the body can be detoxified during the steam. Next, a plant pure-fume steam bath, which utilizes a steam canopy, to warm the body’s temperature to encourage sweating and removal of impurities. The treatment finishes with a plant-based concentrate poured onto a point on the forehead in a continuous stream integrating the deep relaxation of both body and mind. A truly distinctive spiritual mind and body experience. *Please note this is not a traditional “relaxing” spa service but one meant for those looking for a truly unique spa experience or to “detoxify” the body. Please contact us with any questions prior to reserving to ensure your enjoyment of this experience.